The first-grade boys have finally received their first chumashim! As this milestone approached, our excitement grew every day. The boys could barely wait. Some of us even had trouble sleeping the night before the big day. 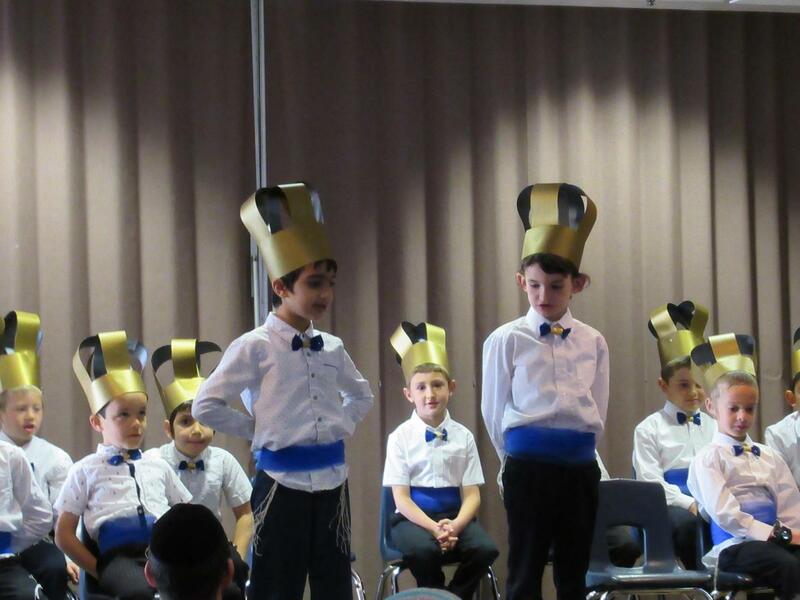 Finally, it arrived- Erev Shabbos Parshas Zachor - the day of the first-grade boys' Chumash play was here! 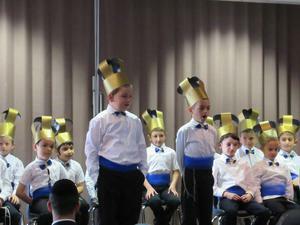 The boys were outfitted in royal garb including a stunning golden crown, a beautiful golden sash, and a stately blue and gold bowtie. 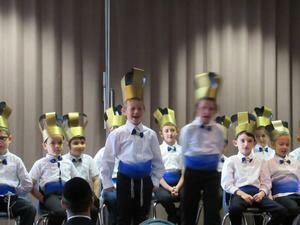 Each boy prepared themselves for the performance with davening and a heartfelt tefilah, then lined up perfectly, in a straight line, and swiftly proceeded towards the Grand Auditorium of Performing Arts at Bethel (nee Looz). Our dedicated fan club arrived and sat down on the edges of their seats. The door (stage left) swung open, and in marched Abo Shakhmurov, followed by his esteemed grademates, who proceeded elegantly to their designated spots on the famous TDSP transportable stage (not to be confused with the transportable pitcher's mound). 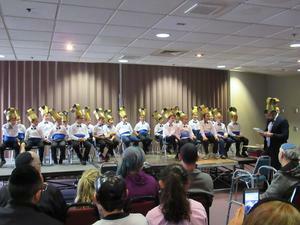 The crowd burst into proud applause; the play had begun. The boys sang a special song composed by their rebbe in honor of this momentous occasion and followed with more songs, poems, and mini-speeches (because nobody likes big speeches). Some boys recited, impeccably, a poem describing one day of the world-creation process and then taught the source pasuk for this day to the class. The crowd was wowed by the precision and calculation in which the two classes knew their class' part and then blended back together in unison and by the perfection and clarity with which each boy performed his part. The boys heard a story, told by our esteemed menahel and master storyteller, Rabbi Field, from which they learned that one who makes up his mind to become great in Torah can and will achieve his goal. 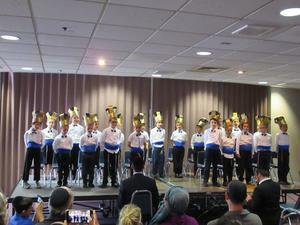 The event climaxed with each precious boy receiving his own pristine, brand-new, heiligeh chumash. Mazal tov! 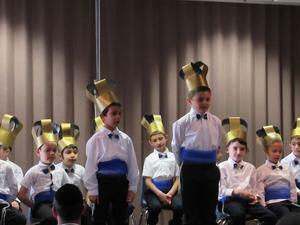 Our first-grade boys have become links in the ever-growing golden chain of Klal Yisroel's rich heritage. All who were present, were treated to delicious food and yummy treats (thank you to the amazing mommies who facilitated this arrangement! 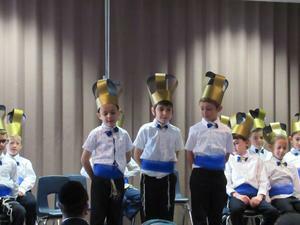 ), which served as reminders that learning Torah is sweet and celebrated the lot of lomdei Torah lishma, those who learn Torah for its own sake. The young talmidei chachomim then returned to class and resumed doing that which they do best: learning Hashem's holy Torah.